One Eternal Day: "Take up the cudgels for the cow"
Things have come to a strange pass when the steer competes with the cow as a butter maker. When the hog conspires with the steer to monopolize the dairy business, it is time for self-respecting men to take up the cudgels for the cow and defend her time-honored prerogatives.... We ought not now to desert her or permit her to be displaced, her sweet and wholesome product supplanted by an artificial compound of grease that may be chemically pure but has never known the fragrance of clover, the freshness of the dew or the exquisite flavor which nature bestows exclusively on butter fat to adapt it to the taste of man.... I desire butter that comes from the dairy, not the slaughterhouse. I want butter that has the natural aroma of life and health. I decline to accept as a substitute caul fat, matured under the chill of death, blended with vegetable oils and flavored by chemical tricks. In the "Dairy State" the dairy industry had a lot of political clout but "even the state’s dairy lobby failed to push through legislation that would have required margarine to be colored pink or brown." 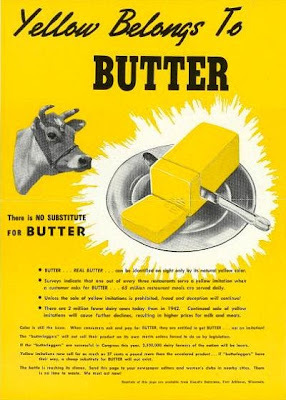 Wisconsin did have laws prohibiting margarine from being died yellow [although butter often was]. In the 1960's this prohibition came under political attack. A great moment in Wisconsin political history...occurred in June 1965 when a blindfolded state senator named Gordon Roseleip stood in the Senate chambers and tried to distinguish butter from oleomargarine. “That’s oleo,” Roseleip said after being fed a small amount by a Senate colleague, Marty Schreiber, who later became governor. Most of the state senators who took part in the blind taste test (the choices: butter, margarine and a spread developed at the University of Wisconsin) identified them correctly but Senator Roseleip got it wrong. "After Roseleip’s death in 1989, one of his daughters revealed that the Senator truly had been handicapped. Worried about his health, his wife had, without his knowledge, substituted margarine for butter on the family table."